Screwfix’s UK website offers 24 hour access to over 18,000 stock lines and power tools at trade prices, dispatching tens of thousands of parcels every week for next day and weekend delivery to tradesmen, and DIY enthusiasts all over the UK. With an annual turnover of over £1.3 billion, the company holds in excess of 4 million customer records all managed by the Screwfix Key Accounts Teams. 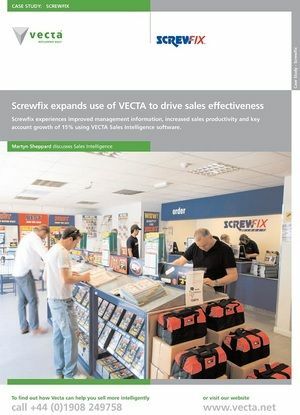 We use Vecta Sales Intelligence to help us sell. A powerful and easy-to-use Sales Analytics & CRM solution that helps to improve sales efficiencies and sales results by automatically identifying and alerting the team of gaps in spend, link-sell opportunities and potential problems with lost or drifting customers. Generates detailed information on further opportunities, prompting sales professionals to sell more proactively.